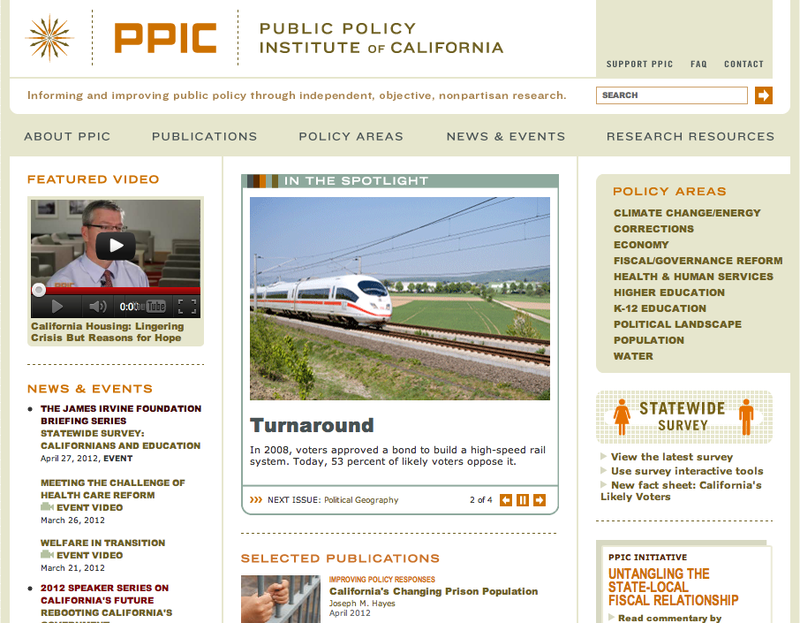 Established in 1994 and dedicated to improving public policy, the Public Policy Institute of California (PPIC) is a private, non-profit organization. Its research interests focus on three program areas – population, economy, governance and public finance – articulated in 15 different policy areas, from immigration to education and health. Through its website, the PPIC makes its findings widely available not only to state and local officials, but also to decision makers in the non-profit and private sectors, the media, and the general public. For each research area, a large set of publications produced since 1996 is available. They include reports, research briefs, surveys (mainly Californian state-wide surveys), fact sheets, special papers, and demographic bulletins. Well-structured webpages give access to full-text reports and abstracts for free, while only for hard-cover full-text copies a payment is required. Each record is downloadable in pdf format without any fee and can be easily located through an advanced search engine or by browsing through clear categories. Many records are available also in Spanish. In addition to publications the PPIC website provides data sets on California as a free service, covering areas not readily available from other sources (i.e. demographic, financial, political participation data).